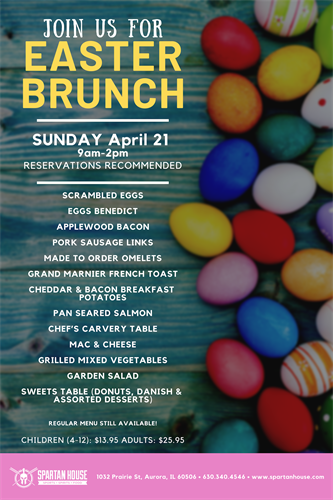 Event Description Celebrate the end of Lent with Spartan House's Easter Brunch! Our buffet has a full range of breakfast and brunch items that has something for the whole family. Grab Spartan Bloodys ($8), Mimosas ($4), or Sofie Mimosas ($5) all day long - the PERFECT drinks for brunch!